A South Florida microbrewery made waves this week (see what I did there?!) by inventing a product that the entire beer-drinking internet could not believe hadn't already been invented: a six-pack holder that doesn't so much "strangle seagulls" as feed them. 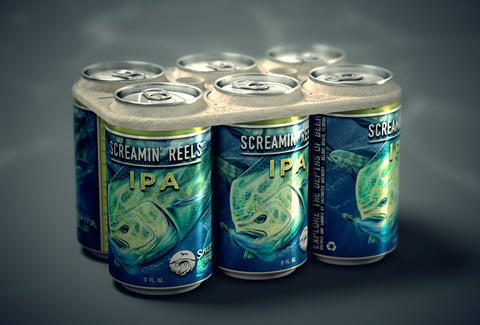 SaltWater Brewery released a video introducing a line of edible six-pack rings made in collaboration with the co-creation ad agency We Believers. The 100% biodegradable contraptions not only keep cans neatly organized, they also feed our sea-creature friends instead of choking them to death in a senseless act of murderous human negligence. Because, contrary to what our moms and Captain Planet taught us, simply snipping the plastic packaging is not, and has never been, a very effective life-saving measure. The video includes music from Explosions in the Sky and enough super-sad-animal photos to send Sarah McLachlan into the arms of the nearest cherub. More essentially, it introduces the edible, compostable rings that are made from barley and wheat, but sadly no onions... yet. The holders are currently on shelves in SaltWater's distribution area, but are admittedly cost-prohibitive, which is why the brewery is appealing to the big guys to adopt the eco-friendly packaging, thus lowering the price point. For now, the people from South Florida can drink easy, knowing that the thing that holds their beers together won't end up choking a dolphin. And hell, if they forget to bring a snack to the beach, well, now there's a solution to that too. Meredith Heil is a staff writer for Thrillist. She's probably in the sky, flying with the fishes, or maybe in the ocean, swimming with the pigeons. Find out at @mereditto.